It is a huge temptation to buy books with abandon, especially if the cover is beautiful or the subject is one near-and-dear to your heart. It’s difficult to determine when standing in a bookstore or at a trade show how useful the book may or may not be. You’ll really only know that when you put the book to the test, when you are seeking an answer or a solution. 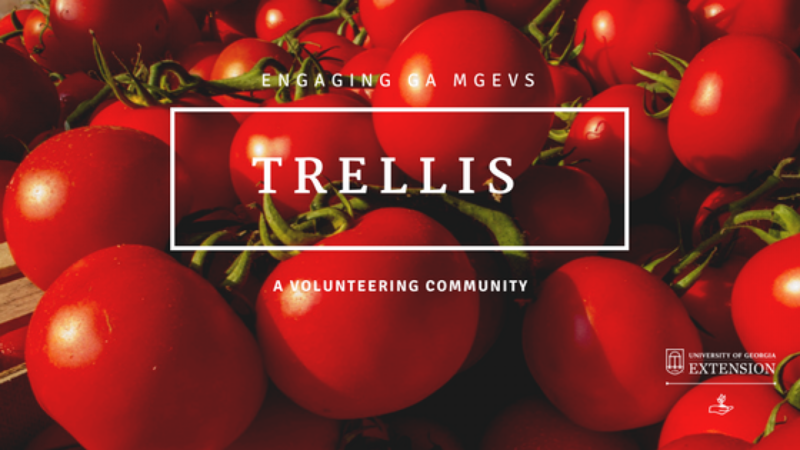 As MGEVs, your knowledge is put to the test every day. It’s not that you are expected to know “everything,” but rather, do you know where to find “everything”? So, I thought we would spend some time reviewing tried-and-true resources that can stock our horticultural libraries. These would be good resources to acquire and keep on hand when trying to answer horticultural questions. So, for example, when someone needs a plant list or recommendations for dry shade, I can turn to page 114 and consider a list of shrubs that bloom in shade or shrubs for dry sites. If I need ground cover options in this spot, I might turn to pages 166-167 and review the lists for ground covers for light shade or deep shade or even “ground covers for cracks.” I read through these lists, consider the specifics of the site, and begin to build a list of plants to answer the question. Be careful — you might get distracted with the perennials lists (perennials for cracks and crevices looks interesting!) or the azaleas chapter or the stories included about the horticulturists who contributed to this book and completely forget about the first question you were asked! The lists in the book (there are more than 200) are great springboards for ideas. If nothing else, I feel more confident in my response because I am not hemming or hahing in a struggle to recall plants suited to the particular site in question. Inevitably, as I review the lists in the book, other ideas and suggestions come to mind and I am able to answer the question successfully. As you can see in the picture, I use this resource frequently, and have many pages tabbed for reference! 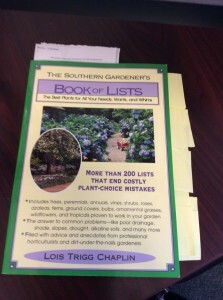 This book has been a great resource to me in getting acclimated to southern plants and gardening in Georgia. Like ALL books about plants, the reader must still have a basic understanding of where they live and garden so that they choose plants that will succeed in their hardiness zone. This is not a comprehensive horticultural text (I still need other references in my library for additional cultural and size information), but it is a fantastic book of lists that make a great start in answering those questions about what-to-plant-where. Keep in mind that this book was printed in 1994. We have learned a lot about plant performance in the 20 years since, so some of the plants on the lists are no longer recommended for landscape use. Some plants have exhibited invasive characteristics, while others, like Bradford Pear, have demonstrated structural issues and are no longer recommended for landscape use. Be sure to consult UGA Extension publications to make sure that plant recommendations are sound. Still, this book is so useful for jogging the memory, starting the thought process, and beginning to answer those plant suggestion questions. I consult it at least once per week for ideas. It is worth space on your library shelves — just put it on an easy-to-reach shelf! Posted in Book Reviews. Bookmark the permalink.